Resilmount A24R sound isolation brackets are specialty brackets that brace walls constructed with a double stud assembly, while maintaining excellent acoustic isolation. Double stud walls, provide a low-tech solution for improved soundproofing and thermal isolation. The air space between the walls is particularly useful for low frequency sound reduction. Chase walls with two sets of studs are also built when extra space between walls is needed for plumbing, ducts, or electrical conduit. Adding brackets to brace between the walls strengthens the double stud wall apparatus as each side of the wall supports the other. 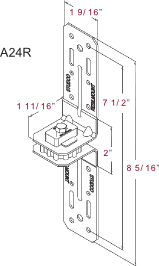 Using an A24R sound isolation bracket provides the extra support to the wall apparatus while greatly reducing the amount of sound vibration that transfers from one wall apparatus to the other when a bracing bracket is used. 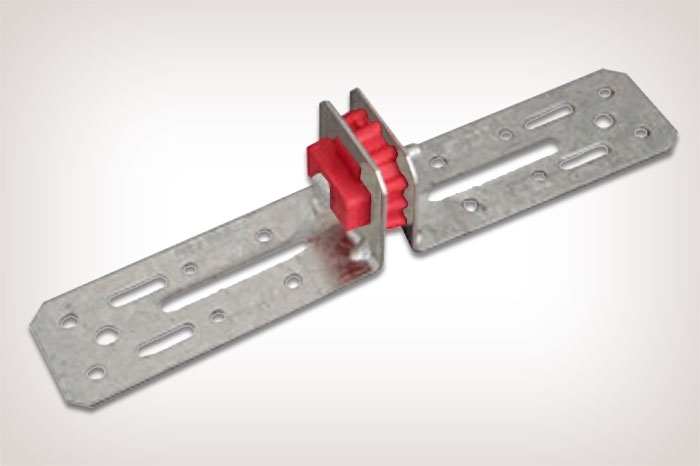 Resilmount A24R resilient bracket's simple design makes installation easy and straightforward, reducing time and cost of installation. Height: 8 - 5/16 in. • Minimum gap between walls is 2”. Smaller gaps down to 1” can be achieved by fixing the bracket on a diagonal plane between the two walls. When mounting the bracket diagonally, extreme care must be taken to ensure the bracket’s fastening surface does not come into contact with the studs on the opposing wall. • Maximum gap between walls is 7”. • A24R to be fastened to structure with a minimum #8 screw or masonry sleeve anchors (see fasteners manufacturers specifications). • When installing, ensure that no part of the two opposing structures are touching or has the potential to compromise the acoustical isolation of the two separate structures. Secure first wall assembly in place prior to installing the A24R brackets. Measure for placement of Resilmount A24R sound isolation brackets on the wall studs (steel or wood). A24R brackets should be spaced 24" apart. 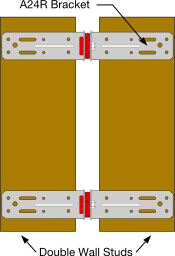 Raise the 2nd wall assembly into place so that there is a maximum 7" gap between the wall assemblies. Fasten the bracket to the 2nd wall assembly. 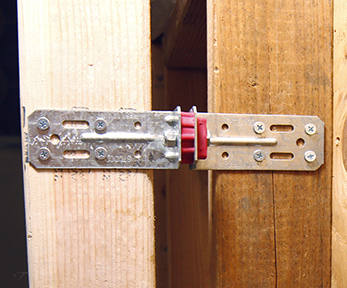 Use appropriate fasteners for the building structure material. Fill the gap between the wall assemblies with sound rated insulation. Raise the drywall into place and fasten to the appropriate wall assembly with standard drywall screws.